﻿ ICT services – KONČAR Elektronika i informatika d.d. High quality and safe ICT infrastructure is the basis for the reliable operation of various business solutions. With directory services, e-mail services, virtualization and optimization of performance we provide the necessary preconditions for the operation of multiple users and enable the use of the benefits of information technology in order to raise the efficiency of the employees and the company as a whole. To insure the operations of our customers, we provide them designing and consulting for the procurement and upgrade of their systems. Simple and high-quality solutions are designed for all companies, regardless of the field of industry which want a reliable, secure ICT infrastructure that simultaneously monitors trends and standards for ICT to be able to smoothly and successfully operate. Our long experience in installation and maintenance of large ICT systems and certified specialists provide top quality service. Users can place their services and data in a private or public cloud. The difference is that in the private cloud user is owner of infrastructure and it has full control over the used resources. On public cloud service, provider is owner of infrastructure and manages user’s resources and the service. 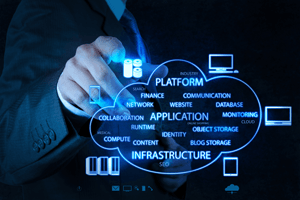 We offer IaaS, PaaS and Saas models and give consultation for optimal usage. Virtualization enables running multiple independent operating systems on a single physical server. This provides better utilization of physical resources (even over 80%) and significant savings in electricity consumption. We implement Microsoft Hyper-V and VMware virtual solutions. Desktop virtualization is the accommodation of the operating system (from user computer) to a central server in the data center. This simplifies administration and reduces costs. For desktop virtualization we use Microsoft technology. MDM is the industry term for the administration of mobile devices such as smartphones, tablets and laptops. MDM is usually implemented as third-party software that has the management capabilities of mobile devices from various manufacturers. We have been implementing solutions on different technologies. Directory services are the basics for identity management. Directory service is a database of object on the network (users, computers, servers, printers) to which you can apply different rules. The most famous directory service is Microsoft Active Directory (AD). E-mail is a service that is used for sending and receiving electronic messages. We implement Exchange mail server and take care of its maintenance and administration. KONČAR INEM is leading regional manufacturer of Electronics and power electronics devices and systems for Energy and transportation sectors and ICT solutions. If you have any questions about our products, please do not hesitate to contact us!